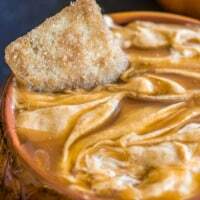 This creamy cheesecake dip is combined with delicious caramel and pumpkin. This dip is a perfect fall dip! I have been reluctant to make any pumpkin recipes. It seems pretty early, and they haven’t even started selling pumpkins yet! But according to Pinterest it is pumpkin season. And all of the delicious pumpkin recipes look amazing! This dip is heavenly. While I was making it, I was eating it by the spoonful. Did I just say that out loud? 🙂 But it combined so many yummy fall flavors. It totally had me at cheesecake. Then with the pumpkin mixed in. Even better. Then swirled with caramel? Mind blown. You will become very popular with this delicious and easy to make dip! Amazingly creamy cheesecake combines with pumpkin and caramel makes the perfect fall dip! In a kitchenaid or with a mixer, combine cream cheese and powdered sugar until frosting consistency. Add pumpkin, sour cream, cinnamon, nutmeg, and cloves. Mix until it is fully incorporated. Pour the caramel sauce on top and create a marble look by swirling with a knife. Serve with graham crackers, cinnamon sugar pita chips, or gingersnaps. I want to swim in this! It’s never too early for pumpkin recipes, Alyssa!! This dip looks absolutely heavenly!! Pinned. 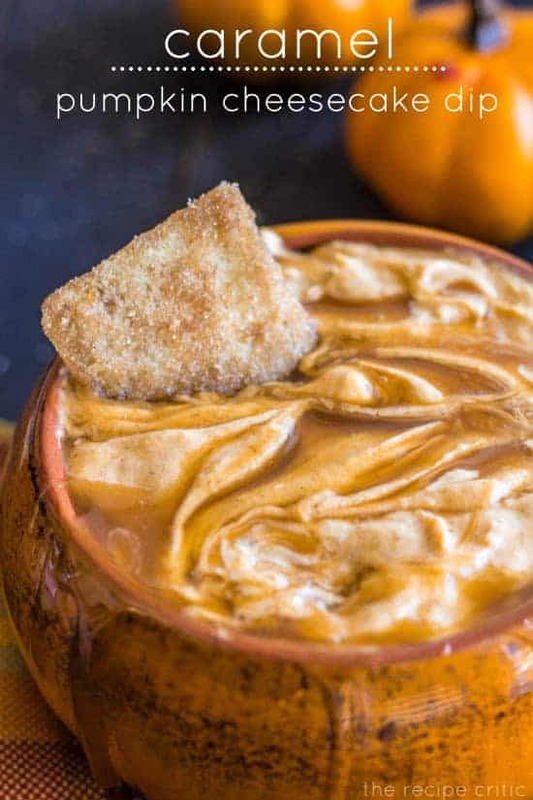 Cannot go wrong with pumpkin/cream cheese dips! I love them! All I need is a spoon! This looks fantastic! Oh sure, it would serve 8 if you blabbed to 7 other people you’d just made it! Can I please dive into this amazing-ness!? Seriously DROOL!! I Have made this 3x now and everyone has loved it. I didn’t have cloves or nutmeg & it’s still very yummy without them – will eventually try with those as well. It’s wonderful with honey crisp apples.. Thank you for the recipe! This looks absolutely divine! Can’t wait to dive in! Can I make this the night before and still achieve the same consistency and yummyness?